One of the original letterheads from Easterday Construction's early days when our main offices were on the second floor of the State Exchange Bank Building, now First Farmers Bank, at the corner of Main and Jefferson Streets, downtown Culver. Notice the three digit phone number! Russell Easterday was a school teacher who worked construction for James I. Barnes Construction (based in Logansport, IN with subsidiaries in Ohio and California) in the summer. He also had a family farm which he managed in his spare time. Russell and his wife, Wanda, had six children. Six children were too many for a teacher’s salary so Russell made the switch to working full time for Barnes Construction. He had advanced from a laborer’s position to job foreman and when the work in Culver, mainly for the Culver Military Academy, became significant enough, Russell was tapped to head the new Culver Division. Russell L. Easterday Construction & Supply Company was created as the Culver division of James I. Barnes Construction. Offices were first opened on the second floor of the State Exchange Bank Building in downtown Culver. Materials and equipment were stored at the family farm at the edge of town on Slate Street, the current location of our main offices. Visit our offices and you will still see the “Pony Barn” which is still used for storage on site. Mr Barnes told Russell that if he wanted to buy the company, he was to put a price on it and Mr Barnes would accept the price offered. Russell had a heart attack just after making an offer for the company. Mr Barnes stopped into the office and said to Everett Easterday, a son of Russell,” I thought that you were going to buy the company”. Everett informed him that the Barnes Construction Logansport book keepers were seeking further financial data. Mr Barnes called his office and told them that they didn’t need anything as he had agreed to accept whatever Russell offered. The deal was finalized that day in 1953. The new company was named Russell L Easterday Construction & Supply Company. It was organized as a partnership of Russell and his wife, Wanda. The name stayed the same until Russell’s death in 1976. At that time it was taken over by Russell’s sons, Everett, Edward, and Jack and a grandson, Larry Berger and organized as a corporation. The name was shortened to Easterday Construction Co. Inc, and has remained under that name to date. The sons eventually retired and Larry Berger became the sole owner. Ownership has since passed to Russell’s great grandson, Kevin Berger. James I. Barnes Construction Company, was a union contractor. This continued over to Russell’s ownership. In the war years and after, the South Bend unions did not want to provide men to Culver, so, even though the company had done a lot of things such as training masons who the union’s then assigned elsewhere, it only made sense for the company to stop being a union company. This let them hire and train many of their own people. Several family members were union members, but dropped out when the company dropped union affiliation. During the second world war, the Kingsbury Ordinance Plant was important to the war effort. There was not enough housing in the area to take care of the number of workers that were needed to man the plant. To alleviate the situation, the company took a contract to move housing from Yipsilanti, MI to the newly created town of Kingsford Heights, IN to house the ordinance plant workers. They were moved whole on semi’s. A crew ran ahead of the house to lift up electric lines and to make sure the clearances on bridges were adequate. Many of these houses are still in use. Melba Easterday and Sue Easterday, two of Russell’s daughter-in-laws worked for him at the Kingsford Heights project while their husbands served in the military. (Melba Easterday’s account of some of that history can be found here.) It was a good feeling for the Easterday Construction to be chosen to return to Kingsford Heights and build their sewage treatment plant in the early 1980’s. Early records are sketchy. 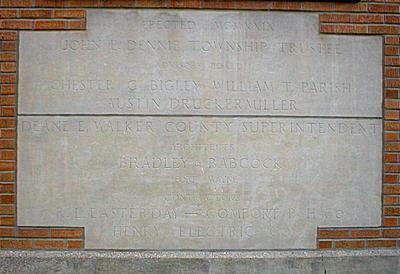 Our earliest project record is cast in concrete on the south side of the Culver Elementary School Gymnasium, where there is a concrete dedication plaque listing construction by R.L. Easterday Construction in 1929. Family stories tell about Great Grandpa Easterday taking the train overnight to Washington D.C. to bid on Post Offices throughout the Midwest. He would then take the train back to find a line of people waiting at the office doors to get in on the projects. This was depression era work, so the wage rate records are fascinating reading. The Culver Post Office was built by Easterday Construction and they have a collection of all the construction site documentation including photographs.